LITTLE ROCK, Ark. 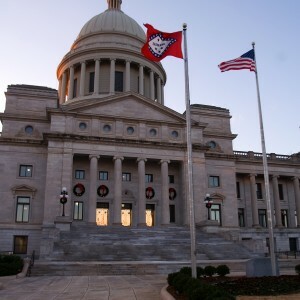 — The Arkansas state Senate is considering a proposal to allow a privately-funded Ten Commandments monument to be placed on the grounds of the state capitol building. The Senate State Agencies and Governmental Affairs Committee approved the proposal by Sen. Jason Rapert (R-Bigelow) on Tuesday, just a day after the motion had failed, sending the matter on to the full Senate for a vote. “The placement of the monument under this section shall not be construed to mean that the State of Arkansas favors any particular religion or denomination over others,” it continues. Rapert points to similar monuments in Texas and Oklahoma being declared as constitutional as legal footing for the placement, including the 2005 U.S. Supreme Court ruling in Van Orden v. Perry. The display would be erected among a variety of displays that are currently on the capitol grounds. But other senators rejected the proposal out of their belief that it infringes on the “separation of church and state.” Sen. David Johnson (D-Little Rock) was one of those who voted against the monument. With the committee advancing the bill, SB939 now moves to the full Senate, where it has fifteen additional co-sponsors. The proposal comes just months after District Judge Thomas Prince of Oklahoma tossed out a lawsuit by means of summary judgment that sought to challenge the presence of a Ten Commandments monument on the grounds of the Oklahoma state capitol. Prince concluded that the monument served a historical purpose and not solely the presentment of a religious message as it sits on a plot of land that contains 51 other expressive monuments. A second lawsuit had been filed against the display, but it was dismissed earlier this month as U.S. District Judge Robin Cauthron declared that the complainant had not proven that she suffers personal injury from the monument’s presence.